Scott sent me this graph today, which is beautiful. Shows that basically, we're being run by bureaucrats who have no idea what jobs are or how they're created, aside from taxing honest people. Here's the link to the original article, where they have apparently revised the original private sector estimates somewhat, but the point remains the same. 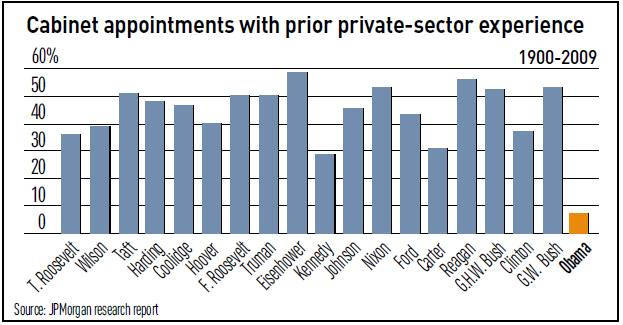 His cabinet, when compared to historical cabinets, comes up short on private sector experience. Obama will make Carter look like a great president. You mark my words.